Eliason pre-drilled frames offer the convenience of one supplier and quicker installation times. 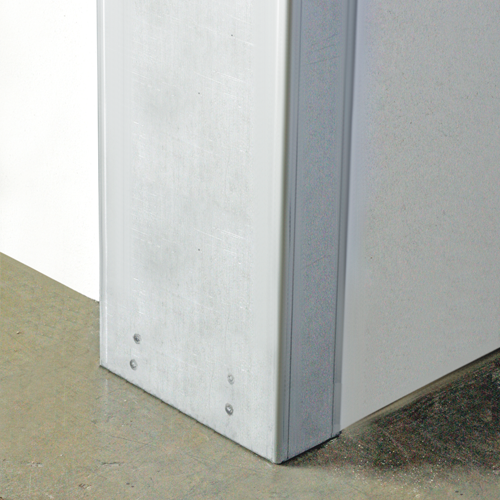 Since the holes are pre-drilled for your exact door, the hassle of drilling holes on-site is minimized, saving you time and money during installation. The Eliason Flush Hollow Metal Masonry frame has pre-drilled holes for top hardware, for fastening frame to the door and for bottom hardware. There are also reinforcement plates located at every hardware mounting point. Frame Design: Rough opening width = finished opening width + 4.50", rough opening height = finished opening height + 2.25"